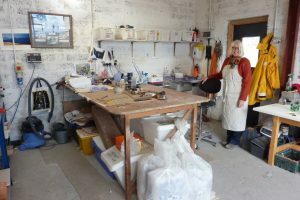 Sue Jack lives in Stoer where (when she is not out and about kayaking, walking or cycling) she spends a lot of time experimenting in her workshop. She loves the fluidity of glass and is always looking for ways to catch this in her work. She originally trained in architectural glass but currently focuses mainly on kiln formed glass working on a different array of pieces. On our stall you will find decorative, functional and sculptural pieces in all colours, shapes and sizes. Her work is very much inspired by the Assynt landscape and the natural world that surrounds her which you can clearly see from her use of colours and textures. Copyright © 2019 Crafty Crofters. Powered by WordPress. Theme: Accelerate by ThemeGrill.